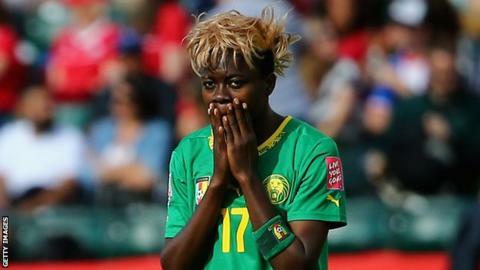 The home of Cameroon forward Gaelle Enganamouit was vandalised in Yaounde following her penalty miss against Nigeria in the semi-finals of the 2018 Women’s Africa Cup of Nations in Ghana. Nigeria’s Super Falcons won the shoot-out 4-2 to book their place in Saturday’s final and guarantee a spot at next year’s World Cup in France. According to Cameroon’s head coach, Joseph Ndoko, relatives of Enganamouit claim people threw rocks at the family residence and then threatened to return. Cameroon face Mali on Friday in Cape Coast in the third place play-off match where the winners will also secure a place at France 2019. Ndoko, speaking ahead of Friday’s match, condemned the attack and said it may have an impact on the team’s preparation for the Mali contest. “It is a very unpatriotic and outrageous act that some persons will attack Gaelle’s home because of the penalty miss,” said Ndoko. Ndoko says the player was not immediately aware of what the reaction back home had been like. “In the team, we take away the phones of the players to make sure they don’t read the negative press about them. Norway-based Cameroon forward Nchout Njoya Ajara, said the whole squad has been saddened by the events. “It is traumatising when you read that the people you’re fighting for can’t forgive you for a mistake. It is pathetic and things like this can make you think twice when you’re called up to the national team. “We choose to fight for our country, to make our compatriots proud but when such things happen, we start doubting if we made the right choice. “Everyone is saddened by the loss to Nigeria but we still have a chance to qualify for the 2019 World Cup. If we can beat Mali we will be in the global tournament for the second time and that is very important,” Ajara said.